I have just finished up a few intense weeks of work and study in which there was no time for knitting. I mean that in the broadest sense of the word. It was for all intents and purposes a period of Knitting, Interrupted. No knitting, no reading about knitting, no writing about knitting, no daydreaming about knitting. 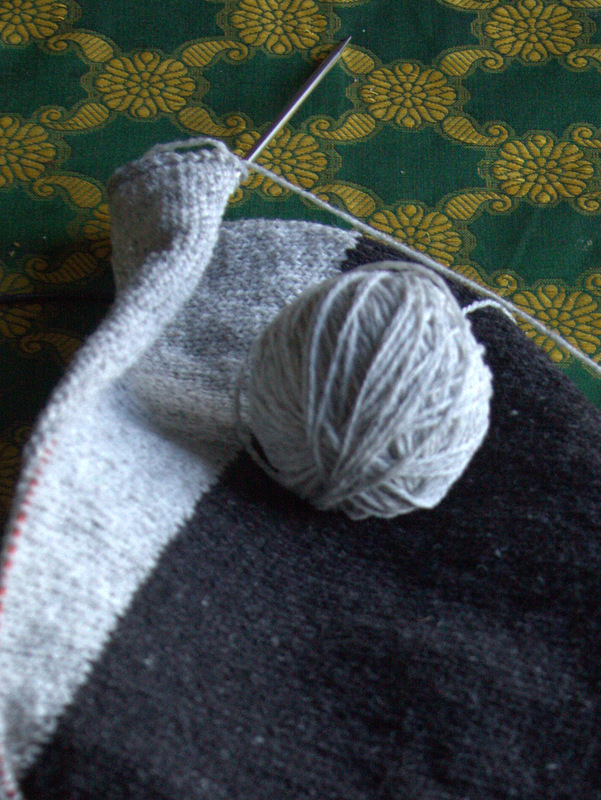 Even in those moments when I was idle, I was too tired to move, much less knit. My thanks to all those who left lovely comments on my last post and on Ravelry about my Lightweight Pullover; I was happy to read them. Despite these past few weeks, I do have some knitting progress to share with you from before my knitting blackout. As with all projects, the first step was the swatch. 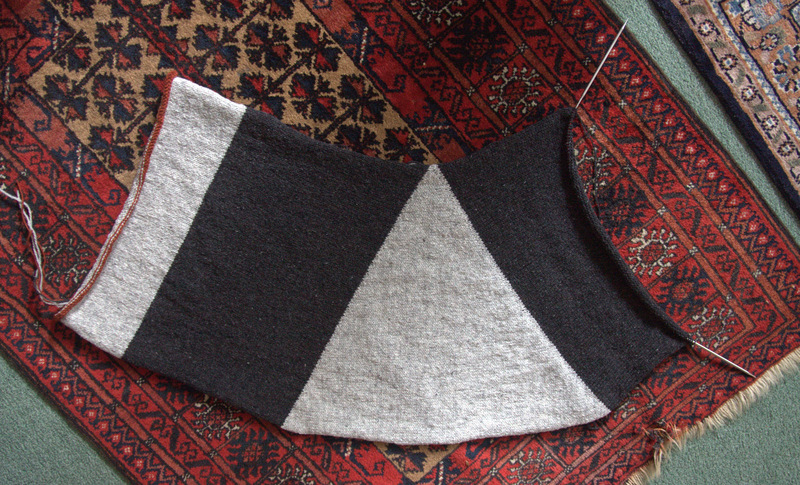 For this sweater, I needed to match a stockinette stitch gauge and a 2×2 ribbing gauge. I started fooling around with some swatches very late (around midnight) on a Sunday evening. I remember this because it was Superbowl Sunday, and here in the UK the coverage started around that time. I also remember it because I had a question about the gauge and I wrote an email to pattern support at Brooklyn Tweed. When I woke up the next morning, I discovered that my email had been answered within two hours of sending it, ON A SUNDAY, and DURING THE SUPERBOWL. There is no denying that is exceptionally good service. The answer was: “The ribbing is blocked more aggressively to achieve the same gauge as the stockinette stitch. 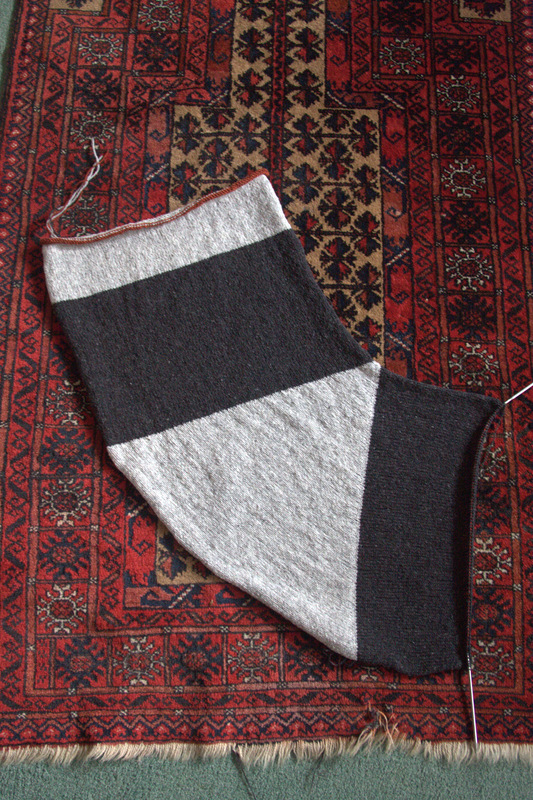 The ribbing will be more flattened out than it normally is.” Message to self: Be more aggressive. The short rows are interesting and the way they shape the fabric quite mesmerizing. It is also pretty fast knitting. A warning, however: it is very easy to do the first side of the triangle, but you have to pay attention on the second. I kept miscounting and had to rip back twice. Finally, I marked each wrap-and-turn with a removable stitch marker so that I could see where I was. Please check out the interview. I love that it shows some of Alexis’ sketches of the original design idea for Escher – before she added the triangle to the back. Alexis has recently written her own post about this design, which you can find here, which has even more info on the design and its development. She also has photos of it buttoned, which are missing from the Brooklyn Tweed shots. Anyone interested in the design process or in this lovely garment should read these posts. I really love the way that the short rows change the direction of the knitting. It makes the piece very striking and fluid. I am nearly done with this portion of the cardigan and have come to the realization that two-thirds of this piece is ribbed. If you don’t like ribbing, this may not be the project for you. I am going to look at it philosophically: all of that aggressive blocking will help get rid of my frustrations. First I’ll knit myself into a Zen-state, and then I’ll pin the crap out of it. More proof of the health benefits of knitting! This entry was posted in Main and tagged Alexis Winslow, Brooklyn Tweed, Escher cardigan, Knitting by knitigatingcircumstances. Bookmark the permalink. Very pretty! I’ll be looking forward to seeing your progress. 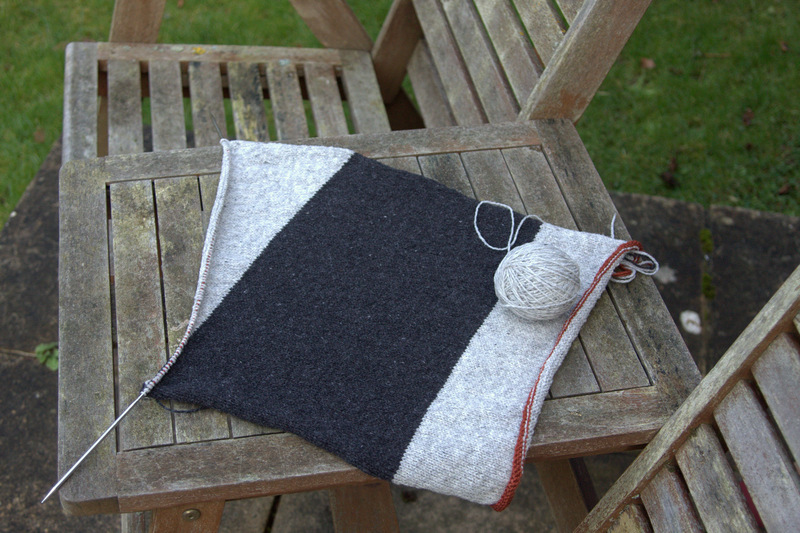 I am an avid reader of your wonderful blog (my favourite knitting blog) and just knitted the Escher cardigan. I did struggle with the ribbing dimensions (it’s just too tight, esp. with the suggested pick-up ratio). You might want to check my notes on the project (pics will be up soon, but for now you’ll have to include projects without images in your search results). My name on Ravelry is ellisj. I hope you’ll have time for more knitting soon! Alice, I checked out your very thorough notes and found them really helpful. I am at the point where I have to decide which needle to use for the ribbing and your comments have definitely cleared that up for me. Thank you so much for commenting here. It looks lovely! Can’t wait to see the finished version! Good luck with getting rested and back to knitting! Thanks. I have so little time for knitting these days, but its always good to have a fun project going to keep my spirits up. Oh no! My sympathies are with you. Soon enough, we will both be knitting happily away…….